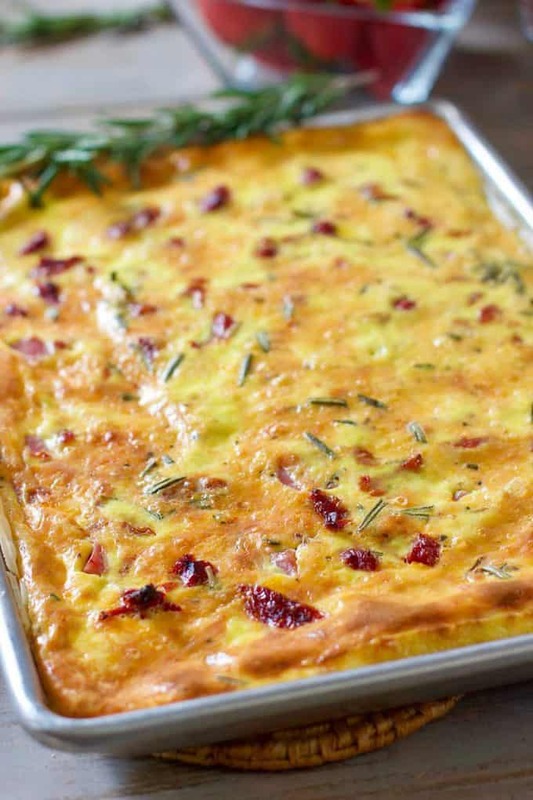 Sheet Pan Quiche! 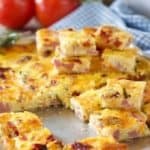 – This super easy quiche recipe makes a great appetizer for a crowd or a wonderful breakfast or brunch! Looking for a quick and easy appetizer to feed a crowd? These Sheet Pan Quiche Bites are perfect! Easy to make ahead of time and easy to tote to your next party! How to make Sheet Pan Quiche Bites! I used one store bought pie crust that I rolled out a bit and trimmed the edges. I used the trimmed edges to fill in the corners of a 15 x 10 inch sheet pan. No need to pre cook the pie crust. This takes about 45-50 minutes to cook so it has plenty of time in the oven. I used ham, cheese and sun dried tomatoes to fill up the crust, but you could use whatever you have on hand! Just don’t forget the cheese…it needs cheese! Fill up your sheet pan with your egg and cream mixture and bake! So easy! You now have either breakfast for 6 or appetizers for 20! 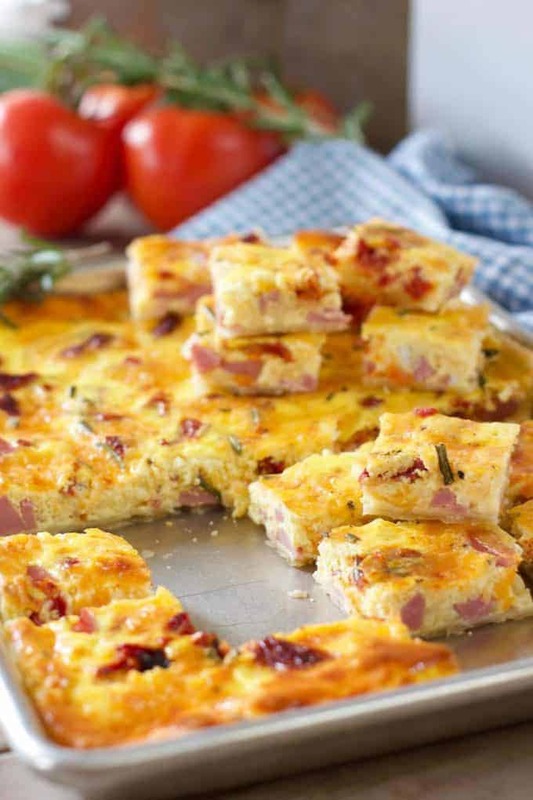 Some tips to make this Sheet Pan Quiche! Use most any kind of vegetable or protein in this: A few suggestions: broccoli, onion, zucchini, red pepper, goat cheese, feta and the list goes on and on! If you are tipsy like me: Before pouring the egg mixture into the pan, pull out your oven rack slightly and set the pan on it then pour on the egg! This is a quarter sheet pan or a 15 x 10 inch pan. Simple double the recipe for a half sheet. We love eggs around here! Check out these Egg Stuffed French Bread Loafs! Or this Mexican Egg Casserole! Make this tortilla and egg casserole the night before! 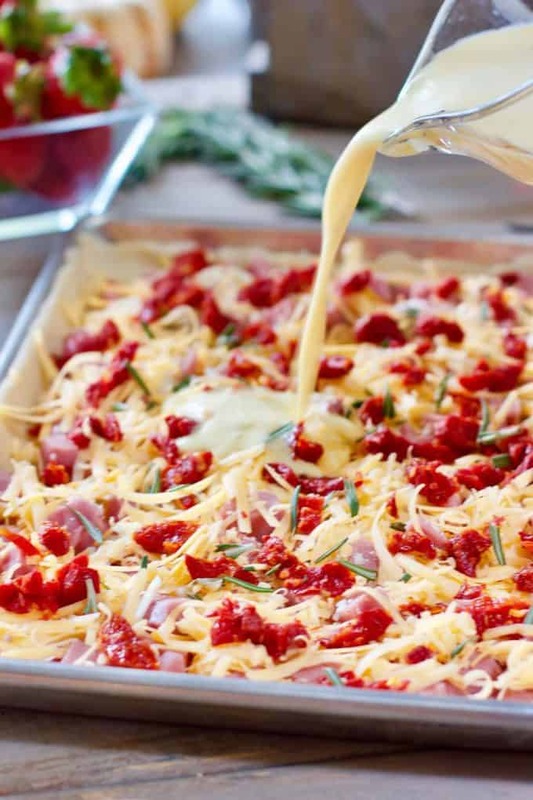 This easy sheet pan recipe can be used as a chilled appetizer or breakfast for 6! 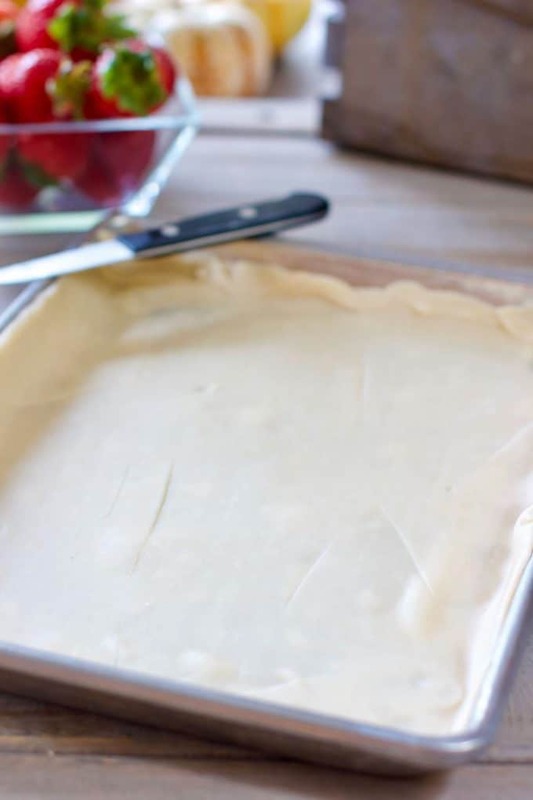 Using store bought pie dough, it's a breeze to make! Spay a 15 x 10 inch baking sheet (or 9 x 13 baking dish) with non stick spray. Slightly roll out one sheet of store bought pie crust and place in pan. You should have some of the round edges hanging over the pan. Remove those with a sharp knife and press into the corners of the sheet pan to fill in. In large bowl, beat eggs. Whisk in cream, mustard, salt and pepper. Sprinkle ham, cheese, sun dried tomatoes and green onion onto unbaked pie crust. Place your pan onto the rack of the oven and pour egg mixture over the filling. Bake 45-50 minutes or until center of quiche is puffed up and slightly firm. Service a a hot breakfast or brunch or chill at least 3 hours and slice into cubes and serve as an appetizer. in this recipe, what is 1 1/2 cups half and half milk and cream mixture? is it just half and half? Oh that did sound confusing! 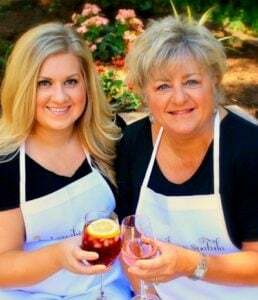 1 1/2 cups of half and half. A cream an milk mixture available in most stores. Some of our readers abroad do not have that product available. I updated the recipe to make it more clear, and hope it helps! I am catering a brunch for 100 – could this froze and then reheated? If I prepare a day in advance, how would you suggest reheating? For a half sheet pan, would it take longer to bake? Thank you! I’d reheat gently either A.) microwave on low for a minute until just heated through or B). wrap in foil and bake at 250 degrees for about 15 minutes. Probably add 10 minutes for baking time, just check the center and a when firm, it’s done!